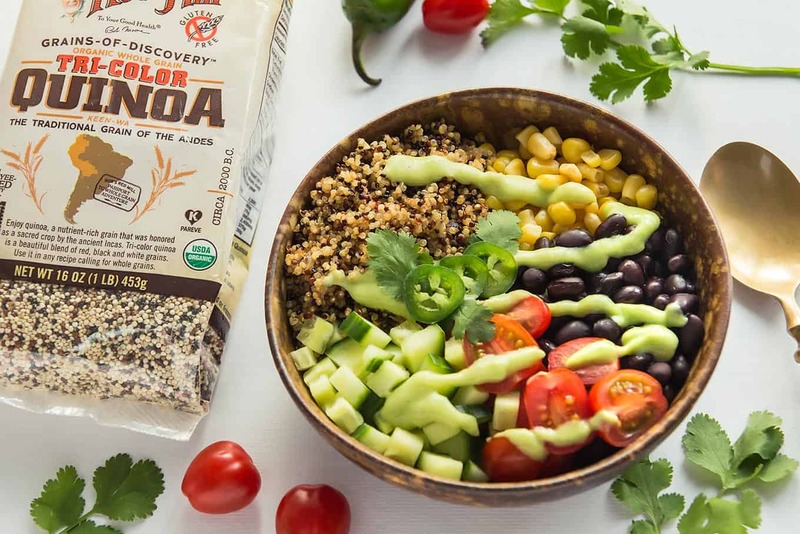 This nutritious Mexican Quinoa Bowl features a deliciously creamy avocado salsa and Tricolor Quinoa from Bob’s Red Mill, who are graciously sponsoring this post. Considering we’ve lived in Mexico for 6 months, it is shocking how few Mexican-inspired recipes are on this blog. I fully intent on changing this over the coming year – starting with today’s delicious Mexican Quinoa Bowl. At the base of this vegetarian Mexican recipe is Bob’s Red Mill Tricolor Quinoa. I love how colourful this blend of white, red and black wholegrain quinoa is, but you can totally sub in their traditional organic white quinoa. Did you know that quinoa is a whole grain superfood? 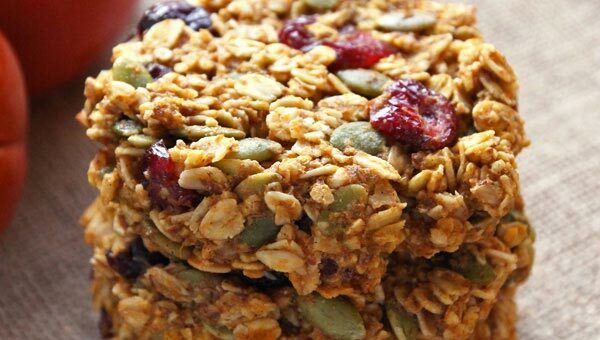 It also is gluten free and a complete protein, which is super rare in plant protein, but makes it perfect for plant-based eating. 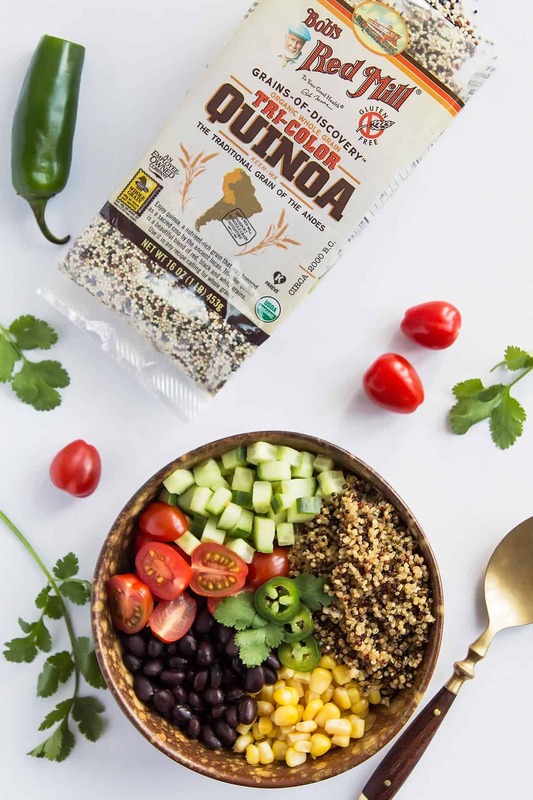 You can find a store that carries Bob’s quinoa here by clicking on the “Find a Store” button and also be sure to get a coupon for Bob’s Red Mill product by clicking on the “Coupons” section. 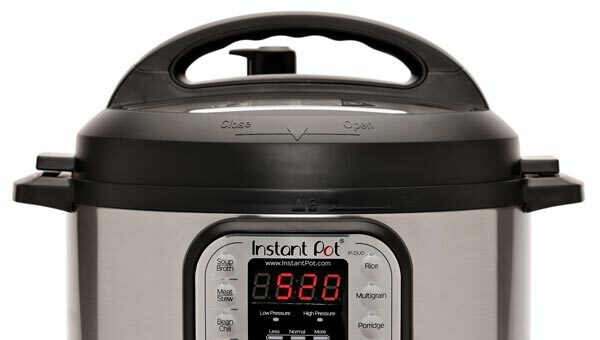 Although it is whole grain, quinoa cooks in as little as 15 minutes! 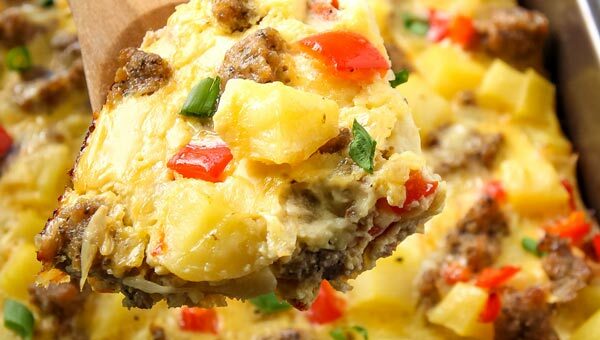 Perfect for quick, healthy meals. For an extra boost in flavor, I first sauté some onion in a saucepan and then toast the quinoa seeds for a few minutes. This gives it a delicious nuttiness. Then, instead of water, I use broth for cooking the quinoa. Simmer the quinoa covered until all of the broth is absorbed. Then take the saucepan off the heat and fluff with a fork. Cover again and let sit for 15 minutes. And ready is you fluffy, light whole grain quinoa! To make Mexican style quinoa, I add black beans and cooked frozen corn – these can be heated for warm vegan bowls. And for vegetables some halved cherry tomatoes and diced cucumber. And to finish off this Mexican quinoa recipe, I drizzle it with this amazing creamy avocado salsa. Now, the tomatillo avocado salsa actually gets made first and then refrigerated for at least 30 minutes for all the awesome flavours to meld together. This creamy avocado salsa is similar to guacamole. However, there is no tomato in it and it gets blended super smooth with water for perfect drizzling consistency. Aside from ripe avocados and tomatillos, there are cilantro, onion, garlic, lime, salt and a serrano chile in this salsa. Use as much of the salsa over your quinoa as you like. While I like things pretty saucy, I know others don’t. Most likely, this recipe makes more sauce than you’ll need for four servings. You easily store leftovers in the fridge for a few days, after that it will turn brown because of the avocado. 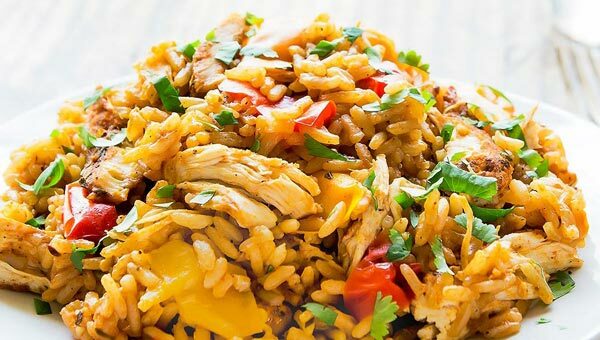 If individual quinoa bowls aren’t your thing, you can totally turn this recipe into a Mexican quinoa salad. To make a healthy Mexican salad with quinoa, simply add all ingredients – once they have cooled – in a large bowl. Then use the creamy avocado salsa as dressing for quinoa salad and toss everything to combine. 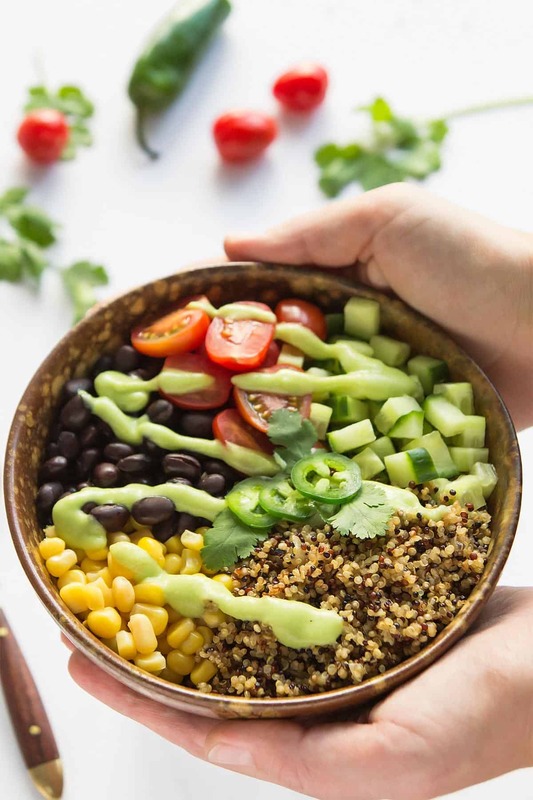 This nutritious Mexican Quinoa Bowl features a deliciously creamy avocado salsa and Tricolor Quinoa from Bob's Red Mill. Start by preparing the avocado salsa, as it tastes best when the flavors are allowed to meld together for at least half an hour. To a high speed blender, add the avocado flesh, quartered tomatillos, cilantro sprigs, onion, garlic, chile (cut off stem, but leave seeds for some heat), lime juice, salt and water. Blend until combined and smooth. Set avocado salsa aside in the fridge for about 30 minutes for flavors to meld. In a medium saucepan, heat oil on medium high and sauté chopped onion. Once onion is soft and translucent, push to side of the pan and add Bob's Tricolor Quinoa to the saucepan. Toast the quinoa while stirring frequently until fragrant and nutty (about 5 minutes). Add the vegetable broth and bring to a boil. Cover and reduce heat to medium. SImmer until all water is absorbed - about 12 minutes. Take saucepan off heat, fluff with with a fork, then cover and let stand for 15 minutes. To assemble the Mexican Quinoa Bowls, divide the quinoa into 4 bowls. Then, add black beans, corn, tomatoes and cucumber to each bowl and drizzle with prepared avocado salsa. Serve with cilantro leaves and chile slices. For an alternative serving option, make cold Mexican Quinoa Salad by combining all ingredients (when cooked quinoa has cooled) with as much avocado salsa as needed to moisten salad. Disclosure: This is a sponsored post written by me on behalf of Bob’s Red Mill. All opinions are as always my own. Thank you for supporting the brands that make Leelalicious possible. How long does the avocado salsa last? What measurements did use to plate your food? It looks delicious! I am counting calories so I want to make sure I plate it correctly. Looks awesome but how much avocado is used? It seems to be missing from the ingredient list. This looks like my kind of lunch! That avocado tomatillo salsa looks absolutely amazing! The recipe purposely makes a lot of the salsa! I love to spoon it on EVERYTHING! 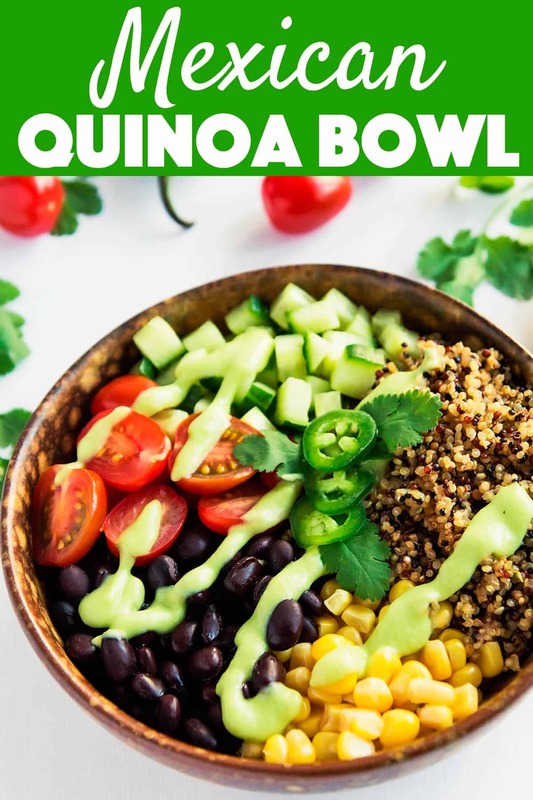 I am loving quinoa bowls lately and this one looks AMAZING! Great video, too! Thanks a bunch Megan. I am all for quinoa bowls – like all the time! 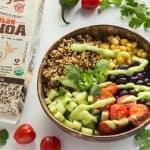 From the fluffy quinoa to the avocado salsa, this mexican bowl has got everything I’ve ever wanted! You don’t even need the meat! 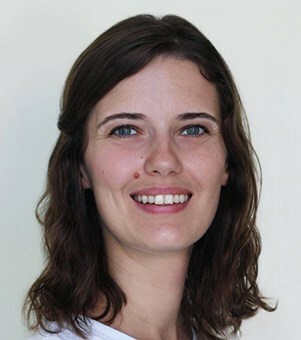 Thank you Bethany! And thanks to the black beans these are filling without any meat protein even.